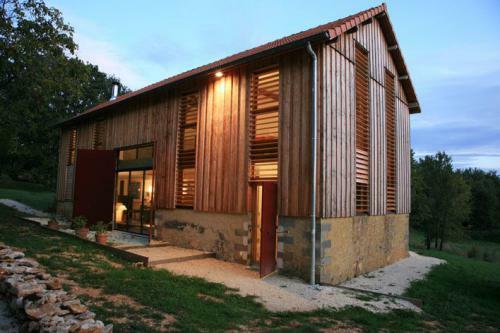 This former tobacco drying barn, so typical of the Perigord, has been lovingly restored. Today it successfully mixes the charm of its original architecture with a modern re looking, and is spacious and luminous. With its four bedrooms and three bathrooms, its huge living room with french windows looking out over the garden, its private pool, it is the ideal holiday destination for happy holidays with friends or family. * a dining area with large table and eight chairs, where you can lunch in the cool of the house. * an open plan kitchen, perfectly equipped to prepare tasty meals with the delicious local produce! * a couple of steps away, the cosy sitting area is furnished with a large sofa, armchairs and coffee table, around the wood burner. - leading off the kitchen area is a laundry room, with a washing machine and all the necessary ironing equipment. - a separate toilet completes the ground floor. From the living room, the wooden and iron staircase leads to the first floor with a large landing and bedrooms at each sides. * On the other side of the mezzanine, the third double bedroom also offers a double bed, bedside table and cupboard space. * The fourth bedroom offers 2 single beds. * the terrace is equipped with a large wooden table and 10 chairs, and is ideal for leisurely al fresco lunches and enjoys the sun all day long. Meyrals is a charming small village in the heart of the Black Perigord. Here you will find a very good bakery and restaurants. For walkers, there is a rich and diverse patrimony waiting to be discovered: the romane church, former bories and many lovely stone buildings. Within easy reach you will find many famous tourist attractions such as Sarlat; the castles of the Dordogne valley; the picturesque countryside of the Vezere valley; Beynac, Domme, La Roque Gageac, Castelnaud la Chapelle - all classed as one of the most beautiful villages of France; the list is endless!